4th August 2014 - Cenotaph, flag market Preston. Preston Remembers - Candlelit vigil. A wonderful, truly magical evening organised by Preston City Council. Beautiful evening weather wise, with many Chinese fire lanterns drifting across the evening sky in the distance. A rare occasion when I wish I had a Nikon for low light photography! Majority of these pictures courtesy of Emerson Utracik. 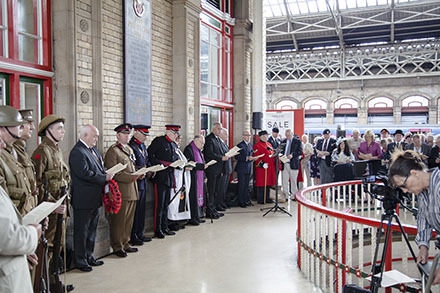 Rev Richard Cook the Railway Chaplain organised this on the Railway station as part of the 100-year commemoration of the start of WWI. 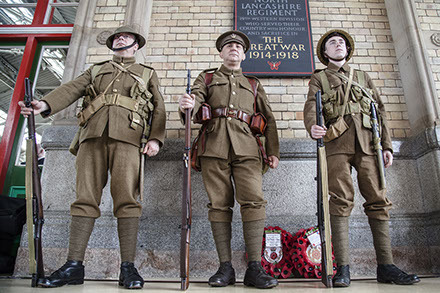 There was a re-enactment of taking the King's shilling, then a service followed by a wreath-laying ceremony in front of the Preston Pals memorial. 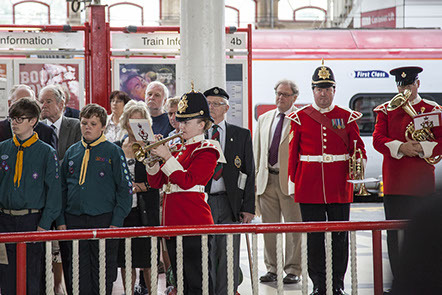 Memorial service on Wednesday, in attendance was Lord Lieutenant, The High Sheriff of Lancashire, The Mayor of Preston and many other distinguished guests. The 23rd July was when most of 'D' Company of the Loyal North Lancashire regiment were killed or wounded in the battle of Bazentin-le-Petit on the Somme in 1916. On the 3 July 2014 at noon, His Worshipful Mayor of Preston Nick Pomfret 'unveiled' a floral tribute to the Preston Pals as part of their contribution to the WWI remembrance. Here are some pictures of the event. It is in the flowerbed in front of the statue of the Earl of Derby. Preston Flag Market, Saturday 28th June. Selection of photos of people including the 99th Garrison (Star Wars) and the WWII re-enactment society with lots of other attractions to be seen. Flypast at 3pm was supposed to be a spitfire, but Hurricane turned up instead. 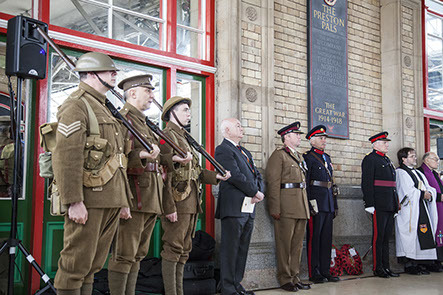 The rededication ceremony took place today on the flag market, Preston at 12.45pm, 80 years after the original dedication and unveiling ceremony by Lord Jellicoe. The old post office behind has also had a good clean up as well. A timelapse video of Preston Pals War Memorial being fixed into position on Preston Railway Station. Today, at 11.00am, Lambert Walker Conservation & Restoration Ltd in Bamber Bridge took delivery of the completed Memorial. The three separate sections were unpacked to check for any issues or damage in transit and found they were perfect. Four of the Trustees were present at the delivery to record it. The next stage is for Lambert Walker to prepare the pieces for fixing to the site involving cutting channels on the reverse side to accommodate special metal 'dog cramps' which will be embedded into the brickwork so there will be no visible screws or holes on the face. 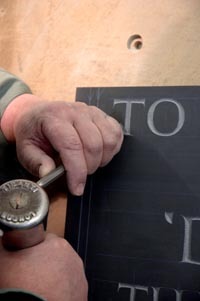 John Shaw, one of England's finest letter carvers started work on the Memorial last month. 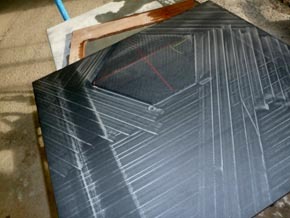 Because of its size and weight the black Cumbrian slate was supplied in three sections. 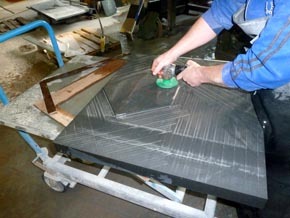 John has finished the lettering and the ‘butterfly’ on the lower part of the Memorial as shown in the attached picture. He will complete the centre section by the middle of February. 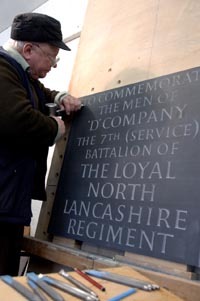 The top section, which includes the Loyal North Lancashire badge, will be finished early March. 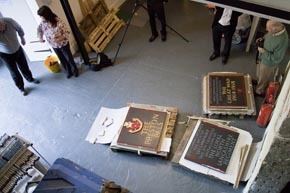 The last stage is painting and gilding the badge and lettering of the Memorial using gold leaf, and special red and grey paints. The Memorial will be completed by the end of March 2012 and be ready for fixing at the railway station some weeks before the planned unveiling. It will be disguised and protected with hardboard awaiting the ceremony. Plans are underway for the unveiling which will take place after May in Preston Guild Year and the actual date will be announced in due course. so please tell friends and colleagues about this very special Memorial and refer them to this website to make a donation. 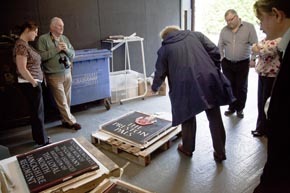 John Shaw, the letter carver, has ordered the Cumbrian slate for the Memorial from Burlington Stone, based in Cumbria. The Memorial, 50 mm thick, 790 mm wide, 2100 mm high and weighing 600 kg, will be supplied in three pieces for ease of assembly. 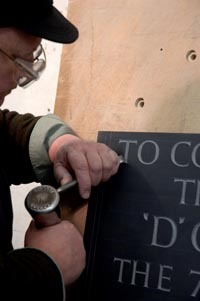 The actual work of lettering and carving of the Memorial will commence in November 2011. 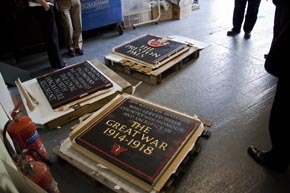 The Trust is most grateful to Lambert Walker Conservation & Restoration Ltd of Preston for their offer to donate their time and expertise in erecting the Memorial between platforms 3 and 4 on Preston Railway Station, for which Planning consent was granted by Preston City Council in April 2011. Polishing the surfaces on the Jenny Lind. I am honoured to make this tribute to Joe on behalf of members, both past and present, of the Preston Historical Society and the Trustees of the Preston Pals War Memorial Trust. 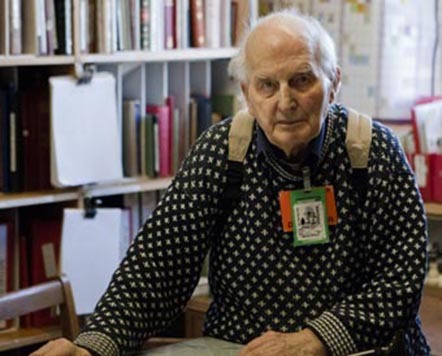 The Preston Historical Society was founded in 1948 and Joe was soon involved serving as Secretary in those early years and then as President in 1976 and 2002. His main contribution to the work of the Society was photographing and recording the changes to the buildings of Preston for posterity. The first meetings were held in the Children's Library in the Harris and Joe dealt with Miss Jane Downton who was then the Chief Librarian of Preston and President of the Historical Society. Other venues which Joe was involved in setting up included the Lillian Wood Memorial Hall behind the old Post Office in Market Street; Grimshaw Street School; The Conservative Club in Guildhall Street; and the Stanley Arms in Lancaster Road. Joe told the story about one Lady member – all women were Ladies to Joe – leaving the Stanley Arms after a meeting when she was confronted by a man with a knife! Needless to say the Society stopped using that venue. Membership of Preston Historical Society. Though easing off his involvement with the Historical Society in his later years Joe continued his work as a volunteer at the Queen's Lancashire Regiment Museum in Fulwood Barracks, until April this year. And as if this was not enough Joe regularly attended meetings of the Western Front Association and was an active member of the Civic Trust. Though Joe and I had never worked together, either with the Preston Historical Society or at the Fulwood Museum, this was about to change. On my reading a letter in the Lancashire Evening Post some three years ago about there being no War Memorial in Preston to the memory of the Preston Pals, I decided the this serious omission would be rectified, and with the help of like-minded people, including Joe, of course, offering special guidance and advice, next year will see the our plans come to fruition. Joe typically had already helped David Huggonson, a student at UCLAN, with his thesis on the Preston Pals, which will form part of a book to be published in 2012. Our first formal committee meeting with Joe and three others in attendance was held in April 2010. The design for the Memorial, its location on Preston Railway Station, fundraising and myriad other matters were all discussed in detail. As you can imagine Joe was tremendously enthusiastic and contributed soundly to a very successful meeting. 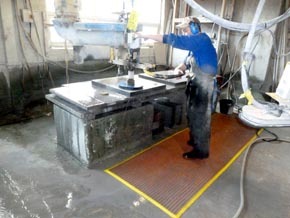 He was also a great help in ensuring that the elements within the design of Memorial should be as accurate as possible. UCLAN, as a project for her degree. She found him and his story fascinating. Needless to say he enjoyed nearly an hour chatting with a pretty young lady and even received a kiss for his thank you! Eventually the Preston Pals War Memorial Trust was set up in April this year with Joe being a very special one of our Trustees. Sadly he was unable to attend the recent Trustees' meeting but he was much in our thoughts. The actual lettering and carving of the Memorial, all done by hand, starts this Autumn and will be ready for erecting on Preston Railway Station in the Guild Year. You can be assured that Joe had played his part in helping to achieve the Trust's objective. a raised area for the LNL regimental badge.